St. Patrick’s Day calls for green. Green shirts, green rivers, green beer and green eggs and ham. Last year I made this luscious homemade creme de minth. But this year I’m sticking to the healthy-side of the green holiday with a super nutritious avocado breakfast parfait. 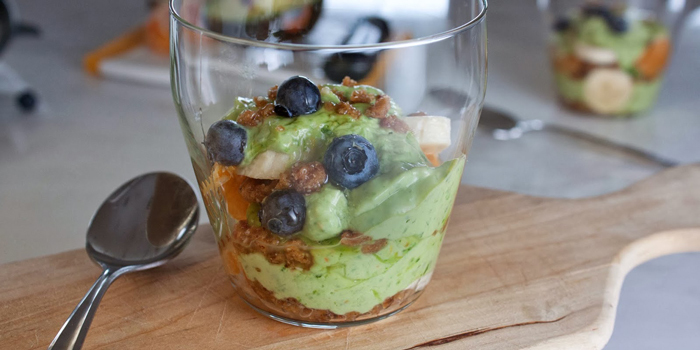 Sweetened spinach and avocado yogurt layered with fresh fruit and topped with almond and date granola. Delicious and filling! It’s a great way to get your leafy greens and healthy fats in at one time. Avocado and almonds, while both calorie heavy, are super important for energy, keeping our skin healthy and for proper functioning nerves and brain. 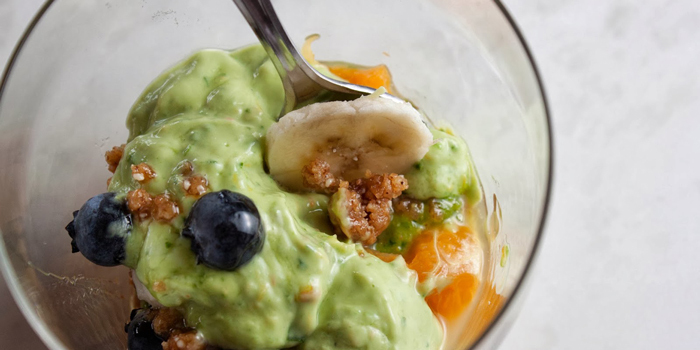 Do green the right way with this Fat and Happy Breakfast Parfait. In a blender, blend the spinach, tangerine zest and 1/2 tangerine until the spinach is chopped up. Add the avocado, yogurt and 2 tablespoons of the sweetener. Blend until mixed and creamy. Layer the avocado yogurt fruit and granola, drizzling the whole thing with the remaining sweetener. *If you like a sweeter yogurt, add more of the brown rice syrup or honey when blending. You can also add additional drizzles of sweetener when layering in the glass. Pulse the ingredients in a blender until everything is finely chopped and beginning to stick together. Sprinkle on the parfait as directed above. Fat and Happy Food Blog Tips and Techniques: Granola is a loose word for this concoction. You can also push this together to form a raw crust. Either way it’s terrific!